I am famous for flaking work events. Folks at the office are on to me and my excuses by now! I wish I didn't have to give excuses in the first place, when there really is just only one reason : I'm a working mom. No no, this isn't a reason that appeals to emotion. To me this is actually very logical. I've spent a good amount of my time at the office and it is but reasonable to have time to go home and take care of home. Alas, corporate culture in this country can be a needy friend : well-meaning but time-sucking. The work events? As a yuppie they were fun. As a working mom they are jobs that take away precious family time so they had better be worth it. 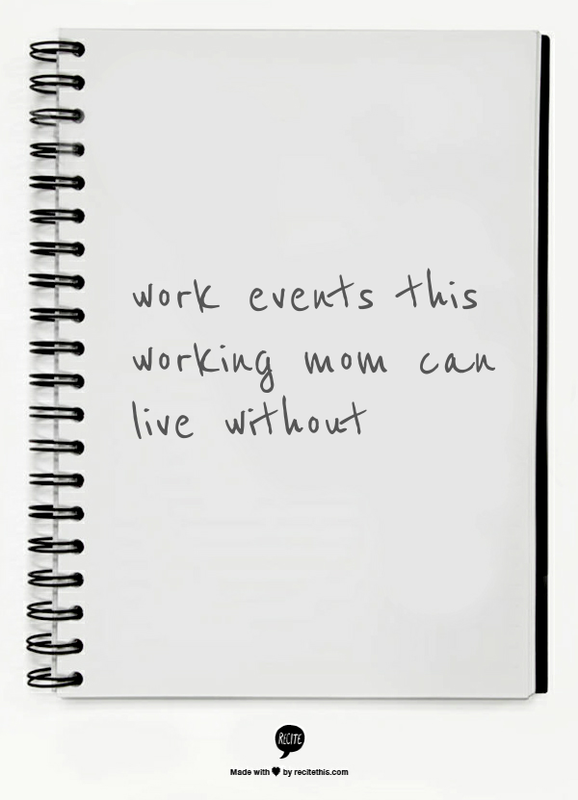 Five years into corporate mom-hood and I can tell you which of these work events are pure torture. Be warned, my opinions may be extreme. But I'm just saying what your dark side is thinking. *** #1 The Big-Boss-Visits-Philippines-Market Schmoozefest Life stops. Drop everything. The Filipino hospitality kicks into high-gear and it's business review preparations and business reviews over dinner. Fine it's actually important, but the sheer amount of time and energy spent is more all-encompassing than throwing your child's 1st birthday party. #2 The Insert-Name-Here Awards Night The word under protest here is "night". Why not awards "day"? Schools do it and more people would actually attend, I tell you. #3 The Team-Building Sportsfest This is not at night, but it's for an entire day of exchanging real work for embarrassment. I am not, have never been, and will never be sporty. Please stop forcing me. #4 The Hey-It's-Friday-Let's-Drink Night This is my Thank-God-It's-Friday-I-Can-Go-Home-And-Start-The-Weekend-With-My-Family Night. Or Date-Night for short. Actually, people have stopped asking me to this. Haha. "Isn't it possible to work well together without all this bonding?" Ten years later, I get it. I'm living the answer -- yes. It isn't an absolute answer since there are work events that are genuine exceptions. But yes, it should be possible. After all, I enjoy the people I work for and work with. People enjoy working with me, too. I love my job and I'm great at it enough to build a career in it. We corporate moms just need to make sure that what we do everyday is worth it. And somedays may we have the unapologetic sincerity to say "it's time for me to be home now". It's the peak of summer's heat wave, and I've finally thrown out the last of our Christmas tree. Yep that's my timing. Sorrynotsorry. I thought I'd continue down the road of regression and share how we've used it for play. Get down on the floor. This is when the magic starts. When you're down on the floor you see the world as your child does. You see how it can be a scary or fascinating place to explore. Then the magic happens : you remember. You remember how you had to take big steps to keep pace with everyone else. You remember playing don't-step-on-the-cracks. You remember that your mother's telephone stand was the perfect pretend-library to sell books. And then it's like you're playing for the first time. Crawl playgrounds and a secret world under the bed... all magic. Remember when swimming pools seemed like an ocean? Well, our favourite Ninang has an ocean. It's actually a small-sized pool. One day she invited Ladybug Girl to swim, said she was going to fill up the pool. Ooh, idea! After a couple of explanations, her Ninang got what we had in mind. This! In my corporate world of marketing, we love using the word "relaunch". New ingredient and packaging? Relaunch. Someone came in early for once (me)? Uy nag-relaunch ka na. Officemate got a new haircut? Ooh what's with the relaunch? 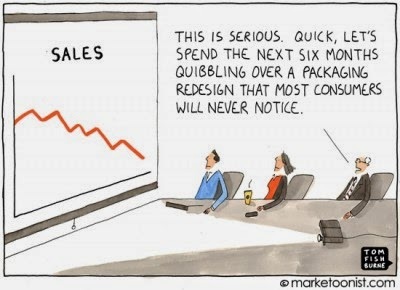 And then there's the vague "restage" which just means you're trying to manage everyone's sales expectations down. In the last year and a half since starting to put myself out there through this blog, I've noticed I've changed. I've let myself become more empowered at work, and I feel I've become less judgemental of others. As a pretty private person, that's a big relaunch. But this blog still is what it was meant to be. I didn't want a diary of my life - you won't see me posting daily reviews and sharing every moment of my family with you. This blog is about useful ideas and thoughts that could be worth sharing with people who connect with my own values on hands-on parenting with a full-time career. 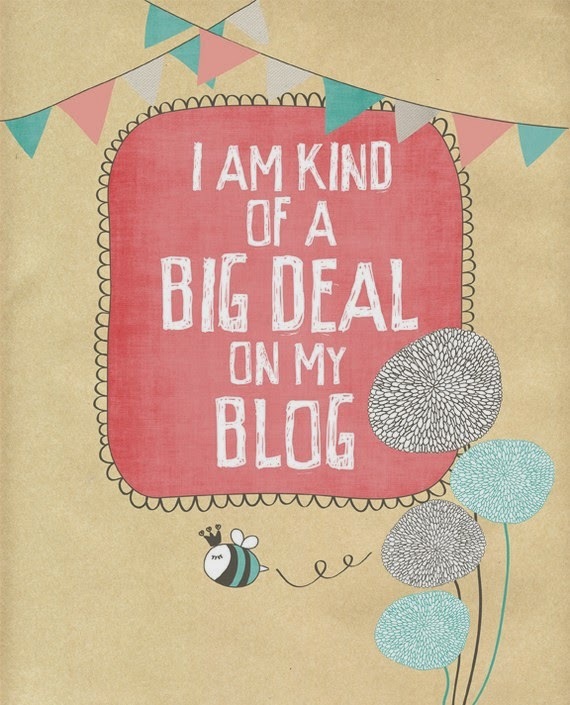 Having a blog is sometimes embarrassing I'll admit, because my husband and I used to snicker at people who have them. This is why. And sometimes this is still true. Hello, humility. I was expecting you. So when you eventually get to read this post, dear reader, I would humbly like to ask for your feedback on this little space. If you're one of my treasured fifty who seem to have found something to follow faithfully, I'd love to know more about you! If you're part of the next two hundred or so to reach this space through a play activity, thank you for wandering over. This new gallery page is built for you. As for this new blog look, this is a restage relaunch restage... I haven't decided yet! I'm notoriously a math-hater and may have passed on the dislike to my daughter by osmosis in my tummy. Unlike other play we do, bringing in math practice takes more brain cells from me. If anyone out there dreads teaching math like me, I hope sharing these simple tools and tricks will help make things easier and *gasp* even fun. Make a line of 'puzzles' that help make math concepts of addition and subtraction familiar. I watched this and this video on Education Unboxed for this idea. Keep in mind these only work after mastering what rod represents what number. This one teaches "what is one plus (a number)?" Just count on. 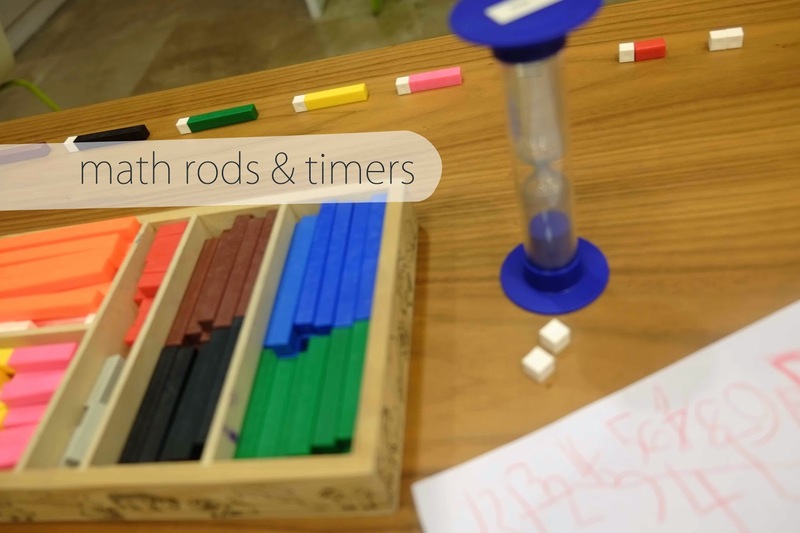 This one teaches the concept of subtraction : "what rod fits in the space?" The timer makes it a game! Turn it over and try to do as much puzzles as you can. Put a little bell at the end to 'ding!' when she's done. as the two sticks. But she rang that bell with gusto! Put down a hundred square to represent the end goal of 100%. Then build the numbers with tens and unit sticks as it keeps going. Almost there! The excitement was contagious. during this time. What goes with eight to make a ten? Two! Now we made another ten! Doesn't that make so much sense?! It's called building number sense, which leads to mental math later on. Kids would be able to do this much better if they have a strong understanding of the concept of our decimal system. Lucky our children! I'm pretty sure my math struggles are because of that lack of foundation too. And now when numbers fly over my head during meetings, I can't keep the blank expression off my face. Haha. I wonder if it's too late for me? Of all the play that we do, mixing colours is the one that never gets old. It's fun and messy and magical. We've been doing it since she was one! Which means this is going to be a big round-up. 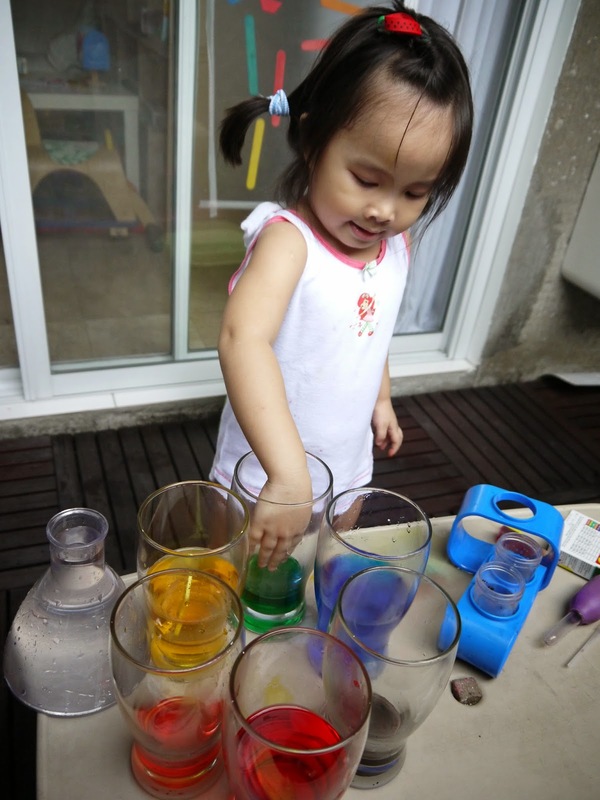 When she was younger and color-mixing was new, play always ended up in brown. Which is fine, didn't make a difference in the exploration or lessons! The best materials, I've found, are poster paint. 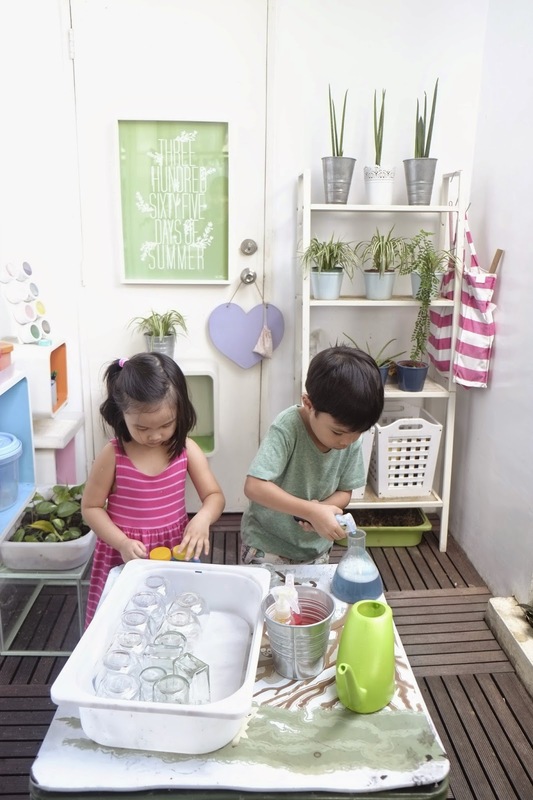 Water-colour sets are cheaper but too frustrating for toddlers to start with. Divert the toy budget to this, and you won't be sorry! ELC poster paint (99 pesos for a huge bottle - this is the best!). What you do with paint is pretty self-explanatory so let me move on to our other favourite material: good old food colouring. We keep ours in both the dropper and a trigger-spray bottle diluted with water. The spray bottles from Beabi are really easy for toddler-strength. Nothing could be simpler. Instead of structured lessons which she gets in her Montessori school, I like to let her play at home with a little help from suggestive materials. 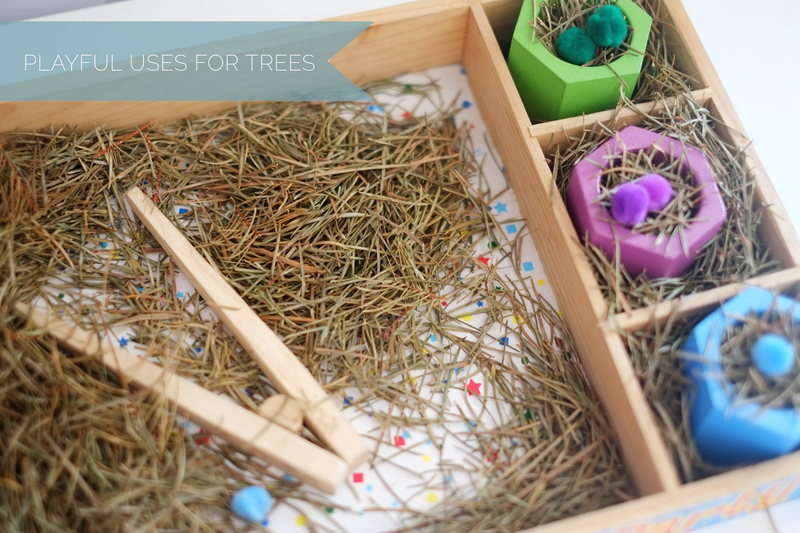 Slap some paper on a tray and get exploring. If you have some water-colour paper use that. This one is all over Pinterest! in the empty glasses in-between. It takes about ten minutes so leave it and check back. I wasn't blogging back then so I only snapped pictures of the play afterwards! Irresistible to any child : learning through touch too. 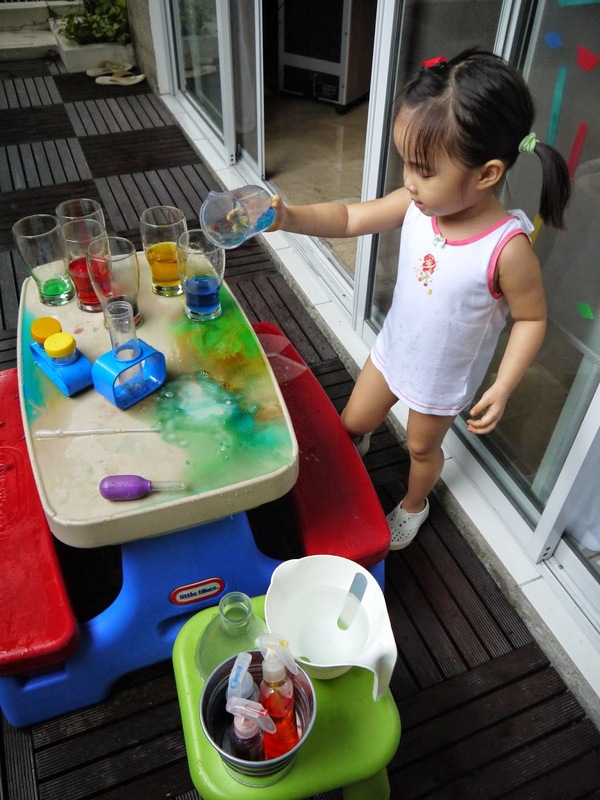 Irresistible in my house: making a mess sensorial play with water! There's every opportunity for colour lessons while you play. She was at this for a whole afternoon. Yes the water will get coloured, and that's okay! This is my go-to playdate activity. Everyone loves it and the kids get occupied for a good hour. We've done the colour-mixing inside the pool many times since. It sparks a lot of pretend play too. Bring out small toys as "ingredients"
but you can also add in water-based scents or artificial flavour with a nice smell. Turn the pool into a bubble bath and mix up pretty bubble colours! No round-up post of mine would be complete without sharing how I adapt these activities into leave-behind play trays for Ladybug Girl to play with while I'm at the office. As usual these are very busy-mom-friendly to do with very little prep work! The idea was to mix up the primary colours in the white sticker label to make the secondary colours. She was too excited to do the tray when she saw it the next morning, so I didn't get a chance to take a "before" photo. We had this water-colour set where you could pop out the colours. So I stuck them on an acrylic sheet (from a cheap picture frame), and then stuck white label stickers to make the rest of the wheel. 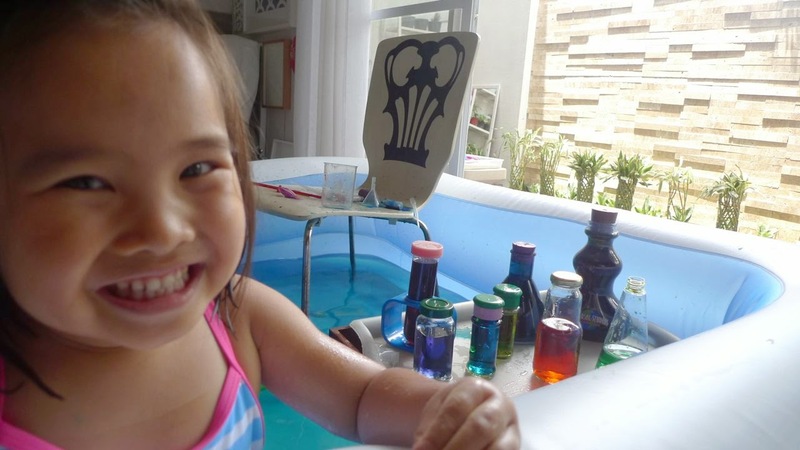 We also do a lot of colour-mixing in the bath - see our toddler round-up and preschool round-up. And that's the round-up, folks. I hope this post wasn't too heavy. There's never enough time to write about all the individual activities that have worked for us, so I'm grateful to you for following this little space along even though I only post weekly (at best!). As we say in office jargon: go for fewer, bigger and better. Haha. Have a happy summer! Our compressed summer workweek begins -- whoopeeeeeee!